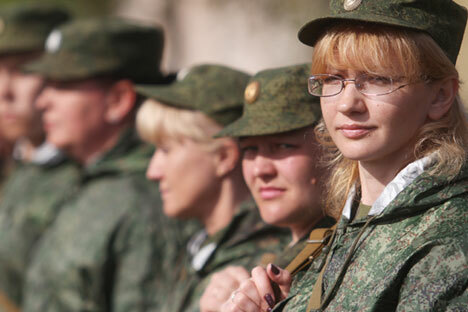 Women may be recruited by the Russian Navy and join surface ship crews within the next three years, after the construction of ships with amenities appropriate for female sailors, a source in the Navy Staff told Interfax-AVN on Friday. "Russian Navy surface ships may have female crewmembers after 2018. Hopefully, new ships with the relevant amenities will be built by then," he said. Yet the recruitment of women for submarine crews will not be even considered in the near future, the source said. Doctors, and signal corps and logistics specialists will be the first to join the Navy if they express such a wish, are physically fit and complete a training course at the Navy joint training center. The list of female servicemen cleared for the Navy will be expanded in the future, the officer said. For instance, women may be serving on helicopter carriers, prospective ships and support vessels of the Navy, he said. Previously, women were not serving in the Navy because of the absence of relevant ship amenities and historical precedents, the source continued. Most new and modernized ships of the Navy will be suitable for the long stay of women, he said. "At least, shipbuilders have assured us of the feasibility of this task. They are waiting for the Navy to set technical parameters and they will make adjustments to the ships design," the source said. So far, the Russian Navy is employing women only on the coast, at communication stations, hospitals and logistics and supply units. Yet women in NATO navies command missile cruisers, frigates and mine sweepers and serve as crewmembers of nuclear-powered submarines.